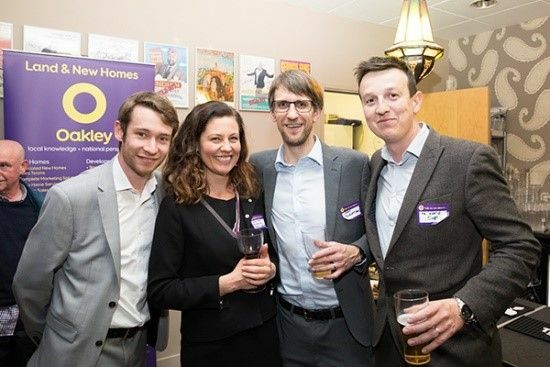 A new office has launched in Shoreham, a multitude of new developments and new homes have been launched across Sussex, TV appearances have been made, and a fantastic fundraising achievement was reached with the Brighton 2 Brussels bike ride. 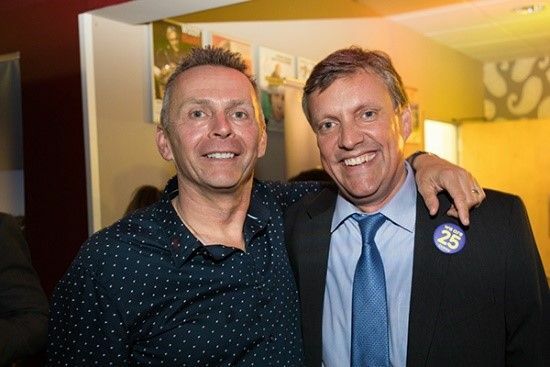 But most exciting of all for the whole team, is the company’s 25th Anniversary, which was celebrated with a big party. 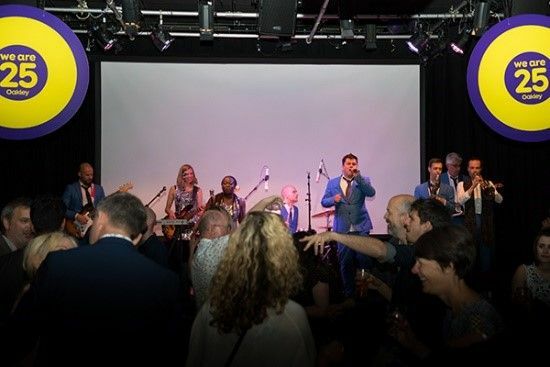 Over 200 guests attended the Oakley anniversary party at Ropetackle Arts Centre in Shoreham, including key players from the Sussex property industry that we have formed positive working relationships over the years. Guests also included long-term clients, former employees and Oakley suppliers and contractors. 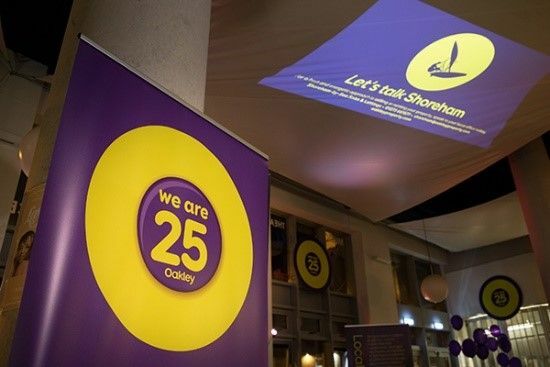 The room was decorated in the instantly recognisable bright yellows and purples of the Oakley brand and large screen featuring many of Oakley’s key projects including Central Park in Brighton and The British Engineerium. The evening begun with a relaxed champagne reception and an opportunity for all to catch up socially, followed by food and a welcome speech from Chris Oakley, who founded the company. Chris spoke about how he begun his career in surveying and saw the potential in the Sussex area for growing a reputable property business that put people before profit. His speech went on to announce that Oakley, in association with Hyde New Homes, had become sponsors of the Ropetackle Arts Centre to help this key attraction for Shoreham thrive alongside the exciting new The Waterfront development that Oakley are launching this summer from our new Shoreham office. Chris paid special attention to thanking his team, particularly fellow surveyor and Managing Director Tim Crossfield, who has been with Chris since the start. The entire team were invited to the stage for an appreciative round of applause from the audience. Chris also went on to thank his long-term clients whom have entrusted their property portfolios with the company for many years. Speeches were followed by fantastic live music from funk and soul band South Coast Soul Revue who kept everyone dancing throughout the night. To keep up with our news and any upcoming events why not follow us on Facebook.